This massive galaxy is an estimated 6 million light-years in diameter. Editor’s Note: There is some debate about the exact size of IC 1101. The information here is based on a number of peer-reviewed articles. Please see the links for more information about the methodology that supports these publications. Galaxies. The universe is littered with them. They have speckled the darkness of intergalactic space for 13 billion years. Images like the Hubble Deep Field are impressive, yet familiar, showing a vast sea of spiral disks that appear to stretch into infinity. However, in the far reaches of the cosmos, are galaxies that are anything but familiar. Galaxies are grouped into three size variations: dwarf galaxies, mid-range spiral galaxies, and gigantic elliptical galaxies. Dwarf galaxies are among the smallest galaxies that have been classified thus far. They are rather small (as the name indicates), but that’s relatively speaking, of course. They’re still unbelievably large in “human terms.” Many of these galaxies are about 200 light-years across, contain only a few tens of millions of stars, and weigh only slightly more than a star cluster. The second grouping includes spiral galaxies, such as our very own Milky Way (more specifically, ours is a barred spiral galaxy). This type of galaxy is the most commonly observed in the universe, making up 60 to 75 percent of all galaxies ever found. Now we approach the largest galaxies – the ellipticals. They range in shape from nearly spherical to nearly flat, and they can contain as many as a trillion stars. For comparison, the Milky Way is believed to contain a mere 100 billion stars (that’s a lot, but not compared to a trillion). This brings us to the main point of this article – IC 1101. Located almost a billion light-years away, IC 1101 is the single largest galaxy that has ever been found in the observable universe. Just how large is it? At its largest point, this galaxy extends about 2 million light-years from its core, and it has a mass of about 100 trillion stars. Some estimates suggests that IC 1101 is 6 million light-years in diameter. To give you some idea of what that means, the Milky Way is just 100,000 light-years in diameter. 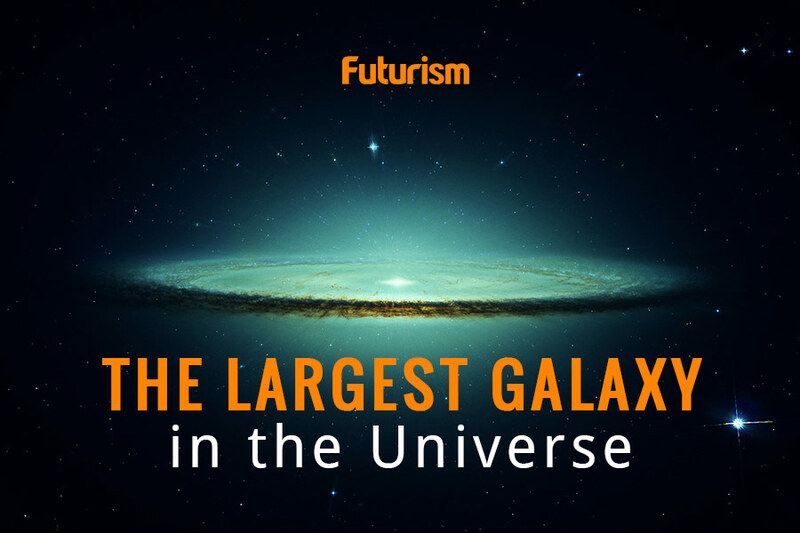 If our galaxy were to be replaced with this super-giant, it would swallow up both Magellanic clouds, the Andromeda galaxy, the Triangulum galaxy, and almost all the space in between. That is simply staggering. Over billions of years, galaxies the size of our own have collided and combined to form this immense structure. Telescopic observations have also revealed an interesting fact about the stars within this galaxy. Normally, blue-tinted galaxies signal active star formation, while yellow-red hues indicate a cease in the birth of new stars. IC 1101 is giving birth to very few new stars. Unless it continues to collide and join with other younger galaxies, IC 1101 will eventually fade away.